Killer whales, with their conspicuous black and white colouration have been recognizable to most since early childhood. However, unlike land animals who have been thoroughly researched and observed by scientists, an underwater creature invites new complications and mysteries. 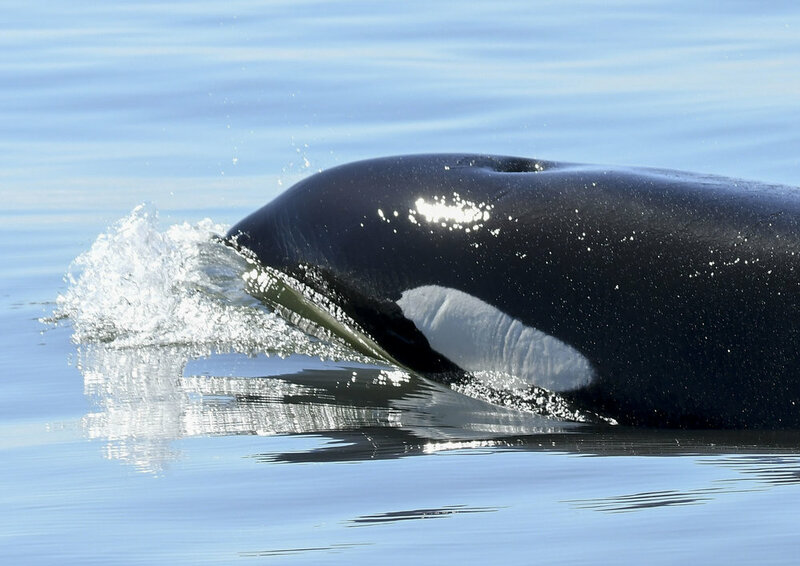 For over 45 years killer whales have been studied off the coast of British Columbia and Washington and the whale watching ecotourism industry is growing. Killer whales are well-documented and loved, but they are still an enigma, giving us more questions than answers. Killer whales are the largest member of dolphin family. Both titles ‘orca’ and ‘killer whale’ are used interchangeably by scientists and public alike. The term ‘orca’ comes from part of its Latin name, Orcinus orca, which refers to "of the kingdom of the dead", and the term 'killer whale' was coined after groups of these animals had been seen hunting other whale species. Our relationship with orca in BC has changed a lot over the past several decades. For example, fisheries managers once viewed orca as vicious predators that should be culled, and in fact it was sport to throw rocks at orca while they swam by or shoot them if they got too close to fishing nets. In 1961 the Canadian government installed a machine gun in Seymour Narrows to cull the population after too many complaints about the abundant population. Although the gun was never fired, it demonstrates the degree to which orca were feared and hated in BC. The first live captured orca, Moby Doll, was caught accidentally off Saturna Island in 1964, and taken to The Vancouver Aquarium, where it survived for 87 days. Following the capture of Moby Doll, 62 more whales were captured and shipped to aquariums worldwide. In fact, most killer captive killer whales in the 60s and 70s were calves that originally came from wild pods in BC. Sadly, an unknown number of orca were killed in capture attempts or died shortly after. In 1973, BC scientist Dr. Michael Bigg completed the first ever census of killer whales in BC. He estimated that ⅕ of the killer whale population along the BC coast had been lost as a result of the demand for captive orca. By 1976 it was illegal to kill or capture orca in BC and Washington state, and they have been protected ever since. Only now, after decades of close observation and research efforts, can humans realize how crucial each individual killer whale is to the genetics and numbers of the entire population. Killer whales live in matriarchal societies, lead by the eldest female of the pod, the matriarch. Mother-calf bonds are some of the strongest known in the animal kingdom, and even once fully grown, many orca continue to spend their lives together. Orca experience their surroundings much differently than we do. While humans are land dwellers and rely heavily on vision, orca thrive underwater in an acoustic environment. Recognized as the ‘wolves of the sea’, the ocean truly is their kingdom. Orca use sound to navigate, locate their prey, and communicate. With brains 4 times the size of ours, their hearing and emotional capabilities are beyond our comprehension. They can navigate seamlessly in a near gravity-free environment using echolocation, vocalizations, and information passed down through their matrilineal family line. 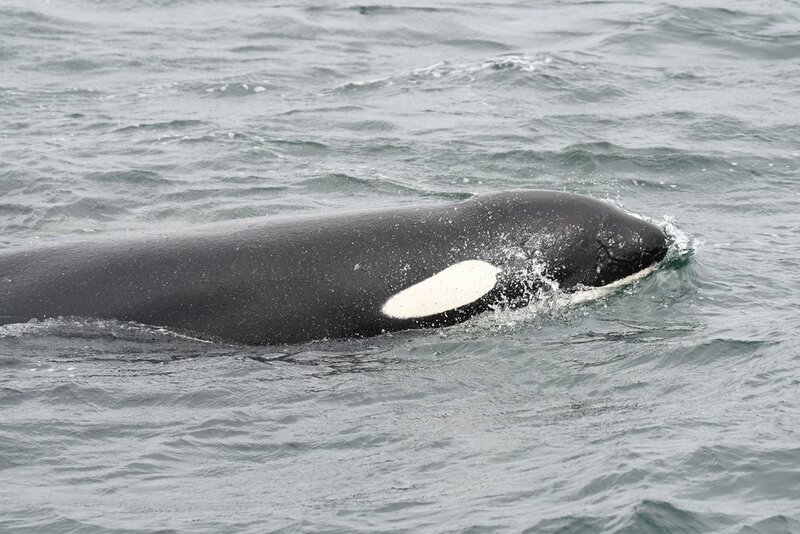 Perhaps surprisingly, orca are found in every ocean on earth, although they are best studied in BC. Orca are the most widespread marine mammal on the planet and the apex predator to boot. Over time, multiple populations of killer whales have evolved to establish “cultures” in various pockets of the oceans. Like humans who have evolved on different continents with separate diets, languages, appearances, and societal structures, these “ecotypes” of killer whales have also evolved in such a way. These ecotypes are genetically distinct; they don't interbreed, they cannot communicate with each other, they have separate diets, and they structure their families uniquely. Off our coast we are fortunate to have 3 different ecotypes and 4 isolated breeding populations of orca. Offshore Killer Whales are found off the west coast of Vancouver Island; they're rarely seen and have never been encountered on our tours. In fact, scientists only discovered them in the 1990s! Offshores along the continental shelf, travel in large groups, and are known to eat many species of fish, including sharks! Although sharks are a top predator in many ocean environments, they are outsmarted by the hunting strategies of the offshore orca pods. Resident Killer Whales are strictly fish eaters who specialize in hunting salmon. Chinook salmon, the largest and fattiest of the salmon species, make up 80% of their diet and are critical to their survival. Breeding communities are separated into a northern and southern population who no longer interact, communicate, or mate. The Southern Resident population usually comes into our range during late spring, summer, and fall when the salmon are on migration to their spawning grounds in the rivers. Sadly, the Southern Resident orca are endangered, and so are their prey, the Chinook salmon. Read more about our commitment to orca and salmon conservation here. Transient (Bigg’s) Killer Whales are perhaps the more “killer” type of killer whale because they hunt warm-blooded marine mammals, and eat nothing else. Mostly we observe them hunting seals, but they also have a taste for sea lions, porpoises, dolphins, and other whale species. Stealth and always traveling to find their next meal, this ecotype was once a rare find in the whale watching industry. However, with the decline of local salmon populations and increased abundance of harbour seals, the “transients are the new residents”. Transients now make up the majority of our whale watching encounters and it is not unusual to witness them making a kill!